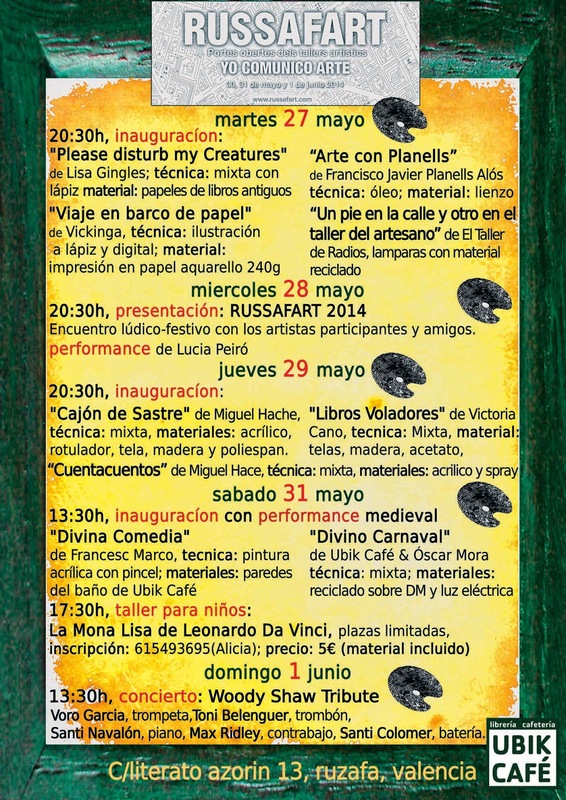 RUSSAFART & OPENING IN UBIK CAFÉ! I am exhibiting next week in Ubik Café as part of the event RUSSAFART. RUSSAFART, is a project that has been running various years now. It´s basically an Open Studio concept in a neighbourhood in Valencia, that over the years has become the IN place to be (must be because I live there, hahaha!!) Loads of workshops, Gallery’s, Bars and shops show various artists work, and where they work! I will be showing in Ubik Café, which suits my work really well, as it´s full of old books! The Opening is on Tuesday 27th of May at 20:30, so please come along and take a peek at my new creations…titled “Please Disturb my Creatures”.